Our last day in Monteverde we also woke up early, this time mainly because of heavy rain and wind. So we took our time packing, checking out and chatting with the other guest. 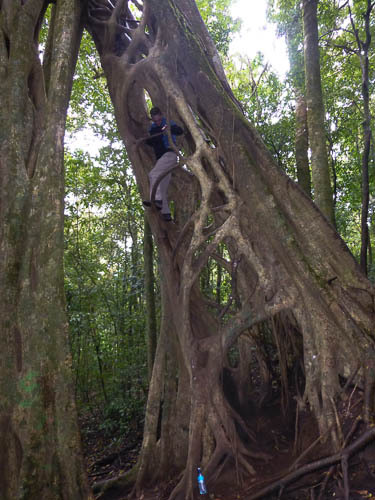 When it cleared up we took a hike to a strangler tree the other guests went to before we arrived. The people at the casa were more than willing to take us there for free, but we decided to go on our own. It didn’t look far at all on the map, but since most roads in Monteverde are very, very steep, it was a good hike, especially after hiking all day the day before as well. The host tree that the strangler tree was growing around had died, so it had a hollow core which could be climbed. Sadly it was very slippery after all the rain in the morning so we didn’t dare climbing it all the way to the top, but it was still cool though. On the way back we stopped for pizza and went back to the casa to say goodbye to everyone before our shuttle at 2 pm. It turned out that 4 other guests had decided to join us in the shuttle, so we got a “private” car the first part of the trip. The road to Lake Arenal was very scenic, but also very bumpy. When we got there we had to wait almost 30 minutes for the boat that would take us to the other side. In this boat we were also joined by people from another big shuttle bus. Some of them were standing outside in the front to take pictures and look at the view, but they all came in when a wave totally soaked all of them. On the other side of the lake we were all crammed into one bus with way to much luggage in the back, so some bags fell down but no one was hurt. We arrived at Arenal Hostel Resort at 5:30 pm, and we got a nice room with good views towards the volcano (except that it was very cloudy and we couldn’t see anything). We got a free welcome drink in the bar which was very good, and after that ordered our favorite local beer, Bavaria Dark. We went for a walk around the city (which is not very big) and went back to the hotel for a small dinner and a couple of more beers. By this time the bartender had filled up the fridge with Bavaria Dark, hoping that we would stay there all night. Instead we went to bed early, planning to do two tours the next day. Again we woke up to heavy rain, so we had to change our plans. We had breakfast by the pool, relaxed in the rocking chairs outside our room and finally got up to date on the travel blog. We also got our laundry done and had a great lunch with jumbo shrimps in pineapple sauce and a local dish with rice and chicken. 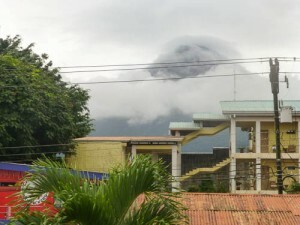 It started to clear up, and we were even able to see the top of the Arenal volcano for a short time. At 3 pm we went on a canopy / zip line tour to Paraiso. We were the only two people in the tour, and had 3 guides following us around. We started with a short walk through the rain forest before arriving at the first zip line platform. The guides showed us how to do it, checked our gear and sent us off the platform. Fun! In total there were 12 platforms and some of the zip lines were over 350 meters long and 80 meters high. 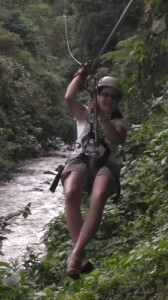 The canopy is located at the canyon of the Arenal River, so we also got great views. We went past two waterfalls, over the river, sometimes over the treetops, other times below or between. On the way we saw two sloths, a snake, a tucan and several other birds. At the bottom we were picked up by a tractor and had a bumpy ride back to the entrance, where a car was waiting and took us back to the hostel. We walked towards the bar, and the bartender remembered us from last night and found two Bavaria Dark before we had time to sit down. At 6 pm they started happy hour, but only on the cheaper beer, but compared to back home the beer is more than cheap enough on full price as well, so that was not a problem. A lot of people gathered around the bar and the pool in the evening, so we stayed there all night, talking to great people from all over the world and giving some recommendations to the people going to Monteverde the next day.